One of my favorite cupcake shops is based here in Somerville, aren’t we lucky?? Kickass Cupcakes in Davis Square is holding a month long contest for a new cupcake idea to list on their menu. The winner will get a year of cupcakes – holy icing, Batman! You can enter as many times as you’d like (read: you can confess the multitude of fantasy cupcake concoctions you possess) so let the creativity begin! So my question is: What kind of a cupcake would you like to see a bakery make? To enter the contest you can either drop it off or send it directly to them at the bakery, or via their Facebook discussion. Good luck! Can’t wait to see what kind of combinations you all come up with!! P.S. 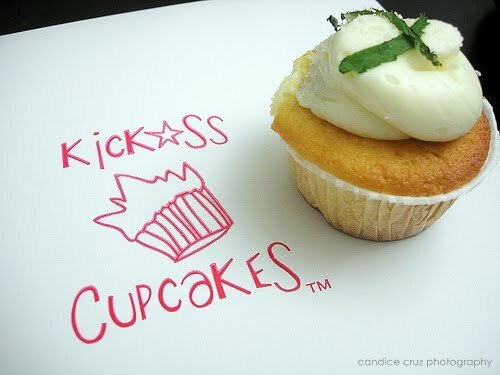 If you ever get the chance to stop by there, try the Mojito cupcake (pictured as a mini-cupcake above)! It’s a rum-soaked cupcake topped with a lime frosting. Yum-o!! This entry was posted in contest, creativity, Cupcakes, Kickass Cupcakes, somerville by shortcakescraps. Bookmark the permalink.